The next generation of Pokemon, Pokemon: Black and White, is wall-to-wall with new Pocket Monsters. That isn't it, though. A preview for the new anime, Pokemon: Best Wish!, shows what looks like a new Nurse Joy-type character (compare above with Nurse Joy). She is visible in the early batch of screenshots released for the game. 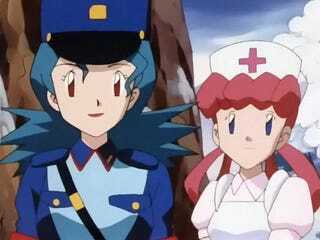 It also shows a new Officer Jenny-type character (likewise, compare with above). Details on both of these Best Wish! characters are forthcoming.